While phase analysis using XRD normally involves the comparison of collected data with a range of known patterns, the discovery of new compounds poses an interesting dilemma. There is nothing to compare with. This was a problem which was encountered when I synthesised two new ceramics in the MAX phase family, nothing in the database could match them. 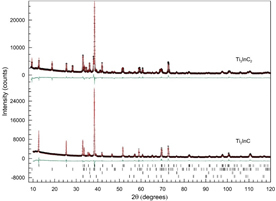 Using the XRD data collected the crystal structure and atomic positions of the new phases, Ti3GaC2 and Ti3InC2, were determined and reported for the first time. Figure 3 - Discovery of a new phase. The top refinement contains a phase Ti3InC2 that was previously undiscovered. Through this refinement process, the crystal structure was determined for the first time. Figure 4 - A sectioned pellet of containing Ti3InC2, one of only 2 such pellets ever made. The phase was discovered and crystal structure determined on the Panalytical X’pert machine at the University of Newcastle.